Pandora for BlackBerry Storm Officially Available | BlackBerry Blast! 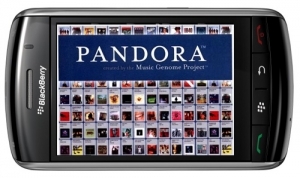 Pandora has launched the highly anticipated version of their service for the BlackBerry Storm. For some reason it is not listed on their dedicated Storm page yet, but it is up and running. The company released the news on their Twitter feed. Get your BlackBerry Storm going and point your browser to Pandora's web site at www.pandora.com, or just go to the App World and pick up the Pandora Radio app.